An alumna uses a multimedia platform to spread her passion for healthy eating. Food Heaven Made Easy launched their own YouTube channel last year. Jessica Jones, right, with her friend and business partner Wendy Lopez. Jessica Jones ’12 is a self-described nutrition nerd. She says one of the first times she realized the impact of healthy eating was when she visited New York City’s farmer’s markets with her job at the Department of Health. She and co-worker Wendy Lopez would go to “food deserts,” and do cooking demonstrations and workshops on topics such as how to get enough fiber or how to save money by shopping seasonally. 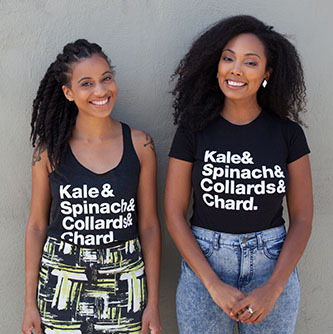 "When they saw us show them how to make kale taste delicious in culturally relevant ways, people would respond," says Jones, who was still working on her Master of Science in Nutrition at the time. "It was so exciting to see people who lost weight or improved their blood sugar." The experience left the pair—who had met through a mutual acquaintance and became fast friends, bonding over their passion for nutrition—wanting to reach a wider audience. So they decided to start a cooking show on Brooklyn Cable Access Television. Their first—for which the two adorned their hair with pieces of kale—was about how to make a three-course meal for a family of four for $10. The show lead to a YouTube channel, a website, a podcast, a blog and then the whole gamut of social media. The next thing they knew, they had regular subscribers and followers to the tune of 60,000 people. The brand Food Heaven Made Easy was born. "We never really were intentional about all that Food Heaven has become so it still feels kind of surreal," says Jones, who has relocated to the West Coast, while Lopez remains in New York. Jones, who recently launched a private practice, has become a contributing writer for self.com and buzzfeed, where she offers bite-size nutrition tips. The television show The List recently named Food Heaven one of four quirky youtube shows to watch at work. The brand has expanded to sell apparel and healthy eating starter kits on their website. They also plan to start doing retreats in Jamaica and to launch a Food Heaven Academy for people who want to take a weekly course on healthy eating. "We are trying to be creative and reach a new segment of the population," says Jones, also an outpatient dietician at a clinic in Northern California. "Helping people live a healthy life and fight off disease is very rewarding." 1. Take your time. Try to spend 20–30 minutes eating each meal. Chew your food slowly and pace yourself. 2. Walk it off. Studies suggest that taking a brisk 15-minute walk after a meal will improve digestion and help to stabilize blood sugar levels. 3. Fill up on vegetable-based sides. These Brussels Sprouts are a delicious option. 4. Don't drink your calories. One can of soda is almost 150 calories, which is nearly half a meal. Try to stick to water whenever possible. 5. Enjoy your favorite dishes. Try to stick to dishes that you absolutely love. Enjoy them in moderation.